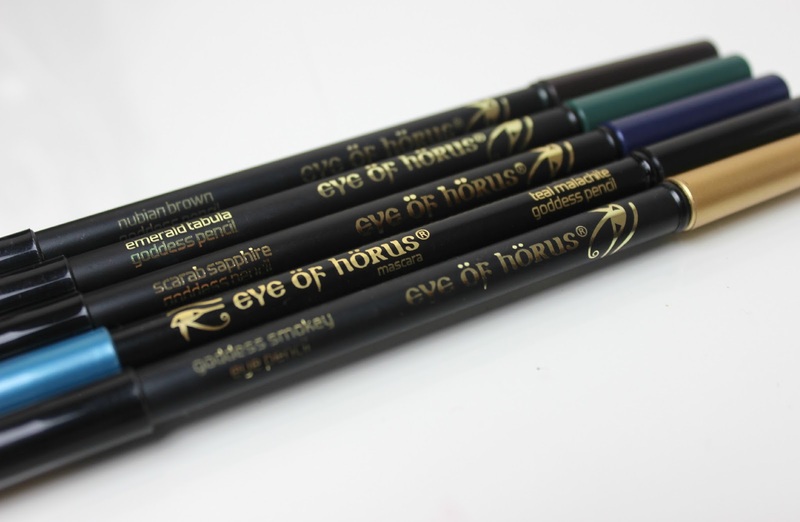 For those of you who don't know, the Eye of Horus ties to Ancient Egypt and Eye of Horus cosmetics use natural ingredients in the same way the Ancient Egyptians would, to create products which are both affordable and effective, without being irritating and being suitable for even the most sensitive of eyes, being Paraben free. Made using a combination of waxes including Bees Wax, Carnauba Wax and Candelilla Wax, each is effortless to apply with a long-lasting waterproof and smudge-proof formula. The pencils themselves are very long and sleek with beautiful gold lettering on jet black. Dual-ended, each has a blender sponge on one end of the pencil, with the liner on the other. With a creamy formula, they are super-easy to apply with no dragging and work well both on the upper and lower lash line. The Goddess Smokey Eye Pencil is your everyday jet black liner, and when I say jet black I mean jet black. One of the most intense black liners I've tried. Nubian Brown Goddess Pencil is a warm chestnut brown that makes a lovely change from black and can be more flattering, too. Scarab Sapphire Goddess Pencil* is a stunning sapphire blue, a lovely shade for the festive season ahead with the slightest purple undertone. Teal Malachite Goddess Pencil is one of my favourites for summer, a captivating teal with a very fine shimmering undertone, whilst Emerald Tabula Goddess Pencil is a deep, cool toned emerald with mossy undertones. At £17 each they're not the cheapest liners on the market, but the quality and longevity well makes up for that - as does the shade range. It's been a long time since I stuck to just black liners, and I love experimenting with different colours and looks. The shades available in the Eye of Horus range are beautiful and workable on an everyday basis, without being too much. The shades themselves are sophisticated, chic, with Teal Malachite and Scarab Sapphire being my favourites. Have you tried Eye of Horus yet?